The Dionysades group of islands seen from Sitia. 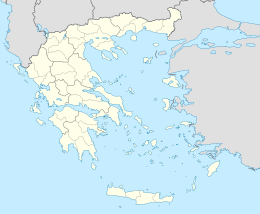 The Dionysades (Greek: Διονυσάδες, also Γιανυσάδες - Gianysades) is a small group of islands off Sitia on the northeast coast of Crete. The group includes the islands Gianysada, Dragonada, Paximada, and Paximadaki. Administratively this group comes within the Sitia municipality in Lasithi. This island group is part of an environmentally protected area with many rare plants and animals including the falcon, Falco eleonorae, which finds sanctuary there. 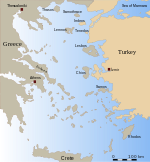 These islands were once a place of worship of the ancient Greek god Dionysus. Archaeologists have found artefacts, from ancient and early Christian eras, indicating that the islands may have been inhabited in the past. ^  Chances and limits of floristic island inventories : The Dionysades group (South Aegean, Greece) re-visited. This page was last edited on 19 November 2018, at 19:06 (UTC).